I woke up this morning at 7am without an alarm (although with the assistance of camel "moans" for want of a better word), and felt fine again. Yesterday in case you did not read my post I had a stomach bug. 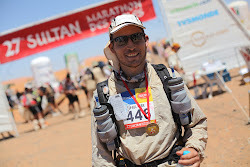 I also had a bit of a sniffy nose the last few days, and was a little worried, as you really don't want to start a race as tough as the MDS with a cold. Several people staying at the hotel had been sick and I was praying that they had not infected me with their germs, despite my best efforts to keep well away from them and to wash my hands like someone with obessive-compulsive disorder (you know like the guy in the American TV series Monk). It seems that whatever I had yesterday is now gone praise the Lord. My stomach is back to normal and I have my usual hefty appetite back. In fact I am so hungry I could eat a camel (if I wasn't a vegetarian). Oh yes and talking of camels, there is something I had meant to say in my post-run post yesterday but had forgotten to include. Whilst I was running out in the hemada I came across the decaying remains of camels. Not just once but several times I stumbled upon them. Now I know that camels die and the owners have to do something with the corpses, but it would be nice if they could put them all in one place or burn the remains, so that people like me don't almost run over them. It is not the best impression to have lingering in your mind after a run.